The exterior of your home defines its character. People, especially passersby, would associate the identity of your home based on how they see it from the outside. These are reasons why it is important to give your exterior painting an extra effort. Your exterior painting might need a revamp anytime soon either due to rough weather conditions, or simply for a transformation. When you decide to do so, make sure you go through careful planning by having a closer look at all your options. 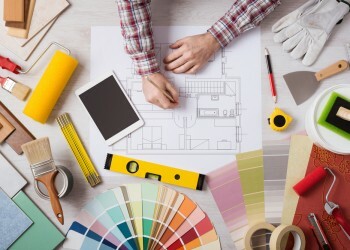 The entire area of your home’s façade is composed of several different kinds of materials and therefore need varying kinds of painting techniques. Parts of it may need paint while others might need stain. Painting block, metal and narrow surfaces would make the job trickier. Some surfaces could be painted or stained over, but most will require paint removal before applying new paint. Either way all surfaces must undergo correct cleaning to make sure the new paint sits directly onto the surface. Surfaces will mostly be stone and wood. Both need a different kind of treatment and would usually require a couple of coats and a combination of different painting techniques such as rolling, brushing, and spraying. Never ever skimp on materials and tools. Remember that the exterior of your home is subjected to all sorts of weather that stress it out. A poor painting job means less protection from outdoor exposure and less value on your investment. After having studied the surfaces, determine the correct method and therefore the tools you need to carry out the job. Before starting to paint, check all surfaces for presence of cracks. Caulk, patch or seal these cracks first. Note that paint will not stick to dusty surfaces so make sure that surfaces are clean and use a good primer. Prime with a quality sealer and the right primer for every surface material. The formula for exterior paint consists of coloring pigment, binders that keep the pigment in place, and the solvents which allow the paint to be spread over the surface. The solvent evaporates once the paint dries leaving behind the pigment and binder. Selecting the right color pigment varies on the type of look you wish to achieve. This is fully customizable and depends only on your taste and preference. The binder, however, plays a more important role in determining the life of your exterior home painting. Higher quality paints, usually tagged as “premium”, contain stronger binders and thus means your paint will last longer and can tolerate the harsh elements than ones with lower binder concentrations. Weather is an important factor in scheduling your exterior painting plans. Paint drying and curing relies on two factors: temperature and moisture. The recommended painting temperature should be above 50F for latex paints but could vary depending on the brand used. Remember that high or low temperatures can cause improper drying of the paint. Surfaces have to be properly prepared as well. When it rains allow at least 48 hours for the surfaces to dry not only on the outside but also within as it may have absorbed water. Paint only sticks to dry surfaces so timing makes the difference between a quality painting job or a disastrous one. Exterior painting requires expertise and careful preparation and planning. Should you find yourself in need of any painting and want professional knowledge, experience and quality hire a professional exterior painting company to do the job. Contact Perfect Painter, serving all of Toronto and the GTA, dial (416) 477-1400.